Last week I shared with you the Easter baskets I made with my three-year olds. Today thePre-K class was making their baskets. They used rainbow colored bags. 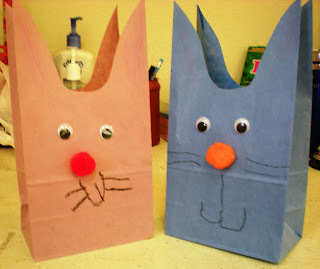 The teachers pre-cut the bags by taking a chunk out of the top and leaving ear shapes. The children then added wiggle eyes, pop pom noses and tails, and finally drew a face. They are very colorful!